It is becoming more common for electrical power lines to spark fires when in close proximity to trees and other vegetation, particularly during the summer months or in dry areas. When fires occur, they can cause serious injuries, deaths, and destruction of property and land. People can be injured or killed attempting to escape the fires or may unknowingly come into contact with a downed powerline. First responders attempting to rescue people from fires may be killed or injured in the attempt to rescue the population or put out the fire. Our lawyers have recovered millions of dollars for injuries caused by power company electrical fires and downed powerlines. It’s important to understand that many of these fires are preventable with proper utility vegetation management practices. In may parts of the country, a power company owes the public a duty to exercise utmost care to prevent fires and electrical injuries caused by powerlines. 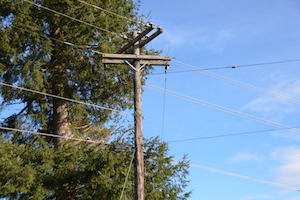 Utility power companies understand that direct contact between powerlines and dry vegetation or trees can spark fires. In order to avoid direct contact, power companies have a responsibility to regularly manage the vegetation around powerlines. This involves crews trimming branches in close proximity to the lines and taking out trees that pose a danger to the lines because of the condition of the tree or close proximity to energized power lines. Power companies have substantial budgets for the purpose of trimming trees and other vegetation along energized powerlines. The National Electrical Safety Code (NESC) is a national standard that applies to power utility companies. The NESC requires power companies to trim or remove vegetation or trees that pose a hazard to energized powerlines. NESC Rule 218 provides: “Vegetation that may damage ungrounded supply conductors should be pruned or removed. Vegetation management should be performed as experience has shown to be necessary.” NESC 218. Factors referenced by the NESC as important to the determination of when action is necessary to trim or remove trees, include: line voltage class, species’ growth rates, failure characteristics, right-of-way limitations, the vegetation’s location in relation to the powerline conductors, the potential combined movement of vegetation and powerline conductors during winds, and sagging of conductors due to elevated temperatures or icing. In order to properly maintain powerlines, utility companies must have safety policies that establish a procedure and cycle for regular inspection of powerlines and trimming of trees and other vegetation that may pose a hazard to powerlines. Unfortunately, power companies do not always do a good job of maintaining clearance between energized powerlines and trees or other vegetation. Investigators have determined that powerlines sparked the large Thomas Fire in California. PG&E also admitted that the deadly Camp Fire was also likely caused by powerlines. Many other fires have been caused by downed powerlines or improper vegetation management practices by power utility companies. Our personal injury trial lawyers are nationally-recognized and have vast experience with fires and electrical injury caused by improper vegetation management practices. We understand and know the importance of the safety rules that apply to power companies. These safety rules are vital to keeping us all safe from electrical fires caused by contact with trees or other vegetation. If you or a loved one was injured, killed or your property damaged due to a fire that may have been caused by a downed powerline or a fire started by a powerline, we offer a free consultation and case evaluation to help you determine if you have a case. Contact us today for a free consultation.